If you ask anyone, who has to share a single computer with other members of a family, would he/she buy a new computer having a few thousands of dollars to spend, make no doubt, you will hear resounding YES. Now there is no need to buy a full set of computer equipment as IBIK company provides any home or office user with an outstanding opportunity to learn how to use two monitors on one computer and operate your PC effectively. We offer you powerful dual monitor software allowing to use 2 monitors on one computer with maximum convenience and top-notch performance. Basically, ASTER is a cost-effective way to obtain another workstation at home just by using 2 monitors on one computer whether it is a standard desktop or laptop. 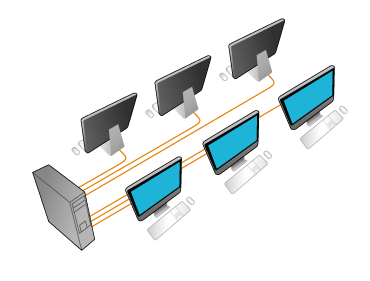 Our innovative shared computer access software allows you to connect 2 monitors to one computer system, so several users can operate additional workstations just like using completely independent computers. Moreover, knowing how to use 2 monitors on one computer, you can save space in your home as well as reduce a noise level, a dose of harmful radiation and electric energy consumption. If you take advantage of ASTER software, you will be definitely surprised how easy is to connect two monitors to one computer box. For using 2 monitors on one computer and equipping a second computer place, everything you'll need is a one more keyboard, monitor (or a TV set) and a second video card. Be assured, unlike using a terminal station or a thin client, you will enjoy excellent and stable performance on both workplaces. Actually, the idea of using 2 monitors on one computer can not only make your life much easier but also provide you with substantial benefits. While offering a reasonable price and an easy installation, our ASTER software will show you how to use 2 monitors on one computer and enhance your computer usage.